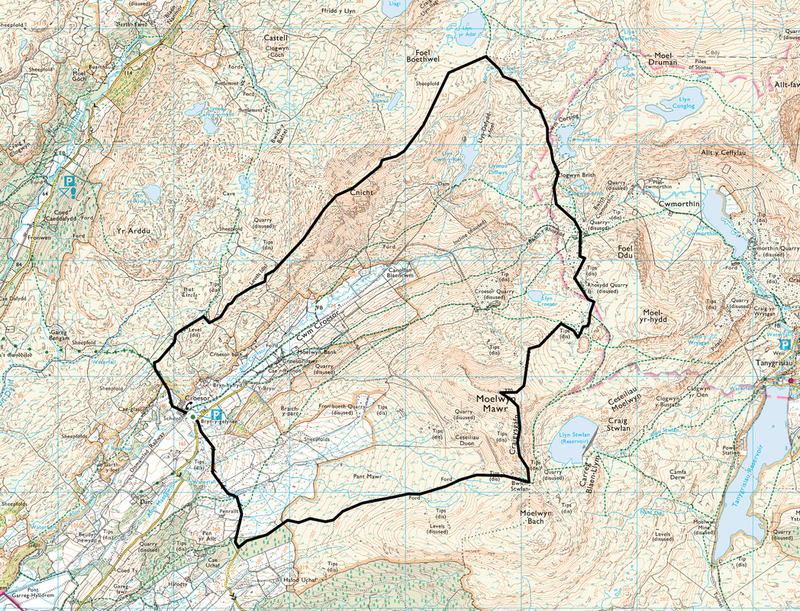 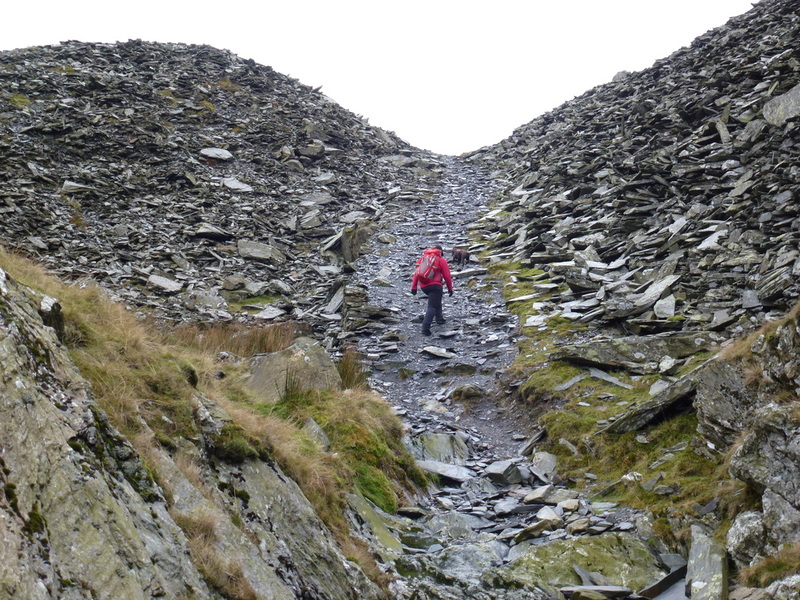 Some good mountain paths for the most part however the path between the lower slopes of Cnicht's North East ridge and Rhosydd Quarry is very boggy in parts and intermittent. 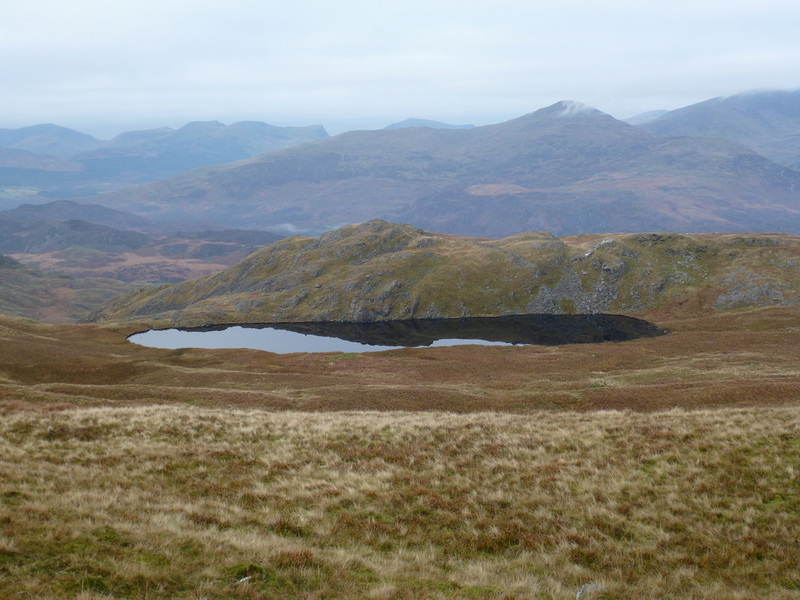 Care needs to be taken on the descent off Moelwyn Mawr and over Craigysgafn to the col that leads up Moelwyn Bach. 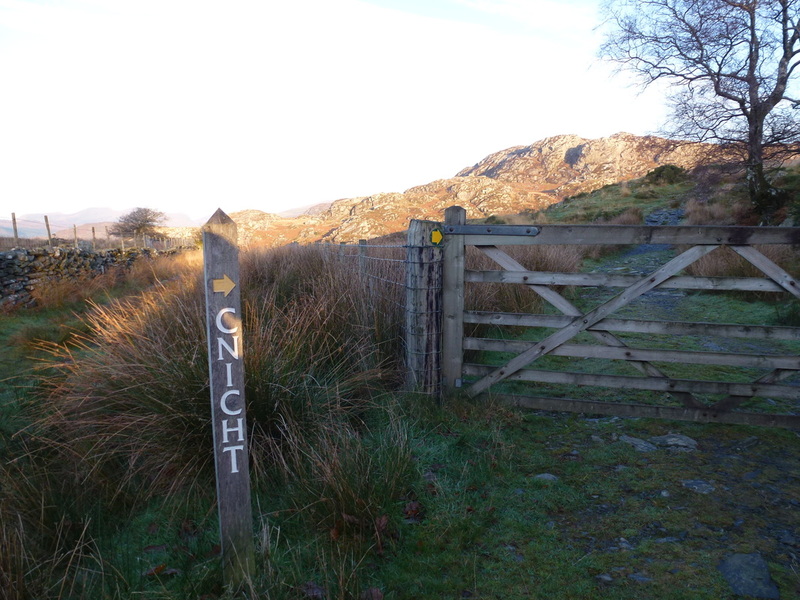 The path over Pant Mawr is also intermittent and the section through the plantation near Penrallt is overgrown in part and boggy in others. 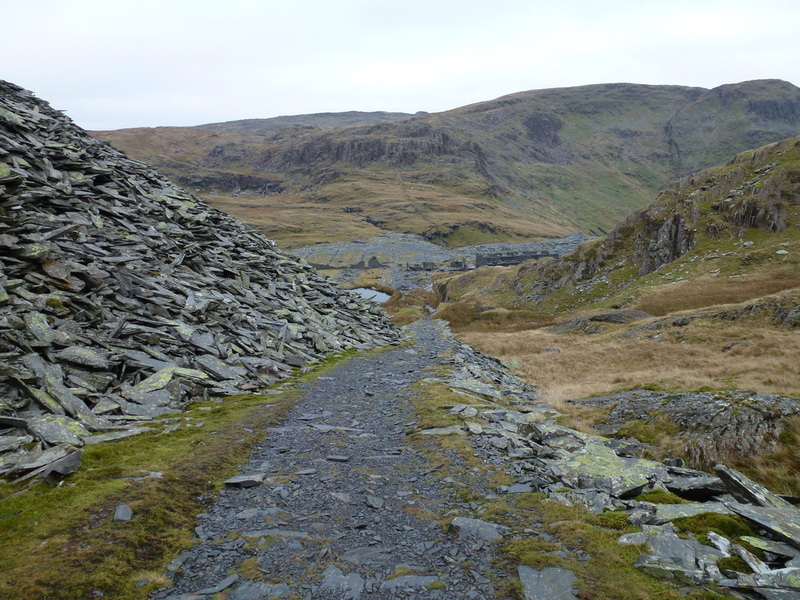 There is a final section of undulating road walking between Penmallt and Croesor. 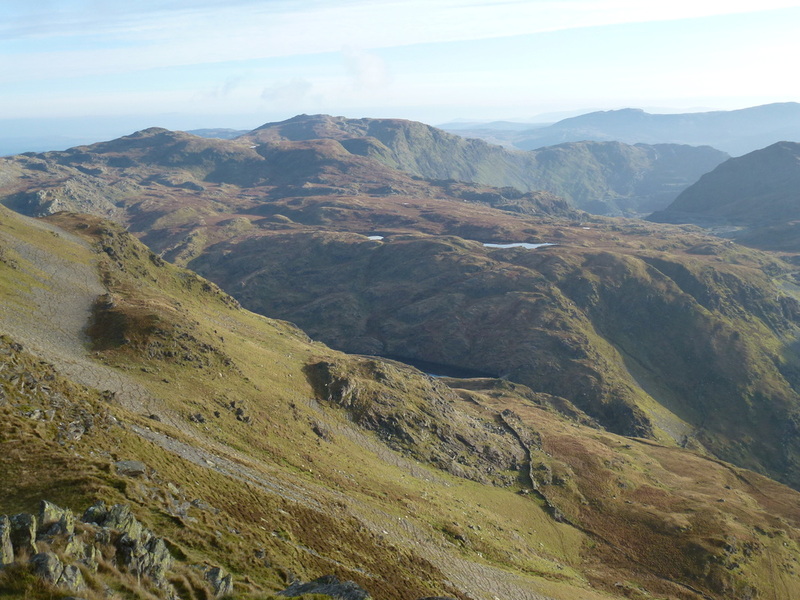 Sunny yet cold, visibility was very good initially. 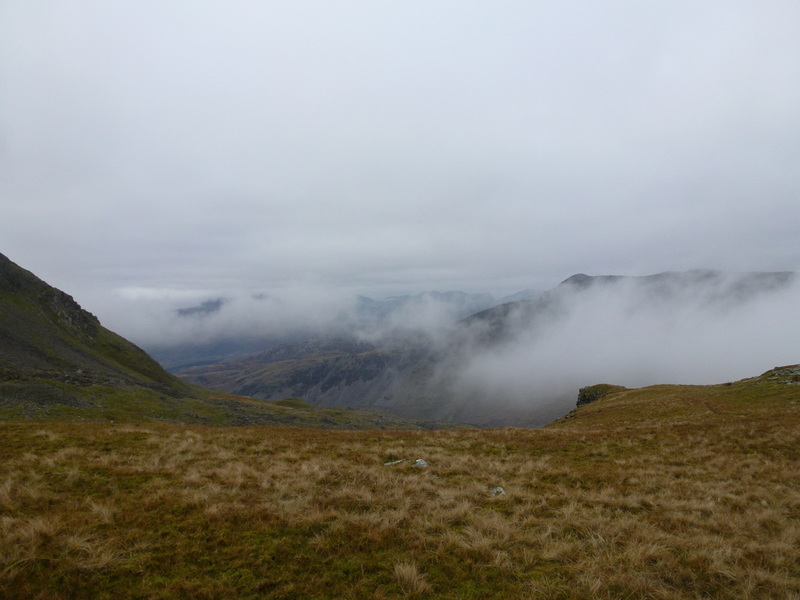 However, approaching Moelwyn Mawr it turned into a thick grey soup! 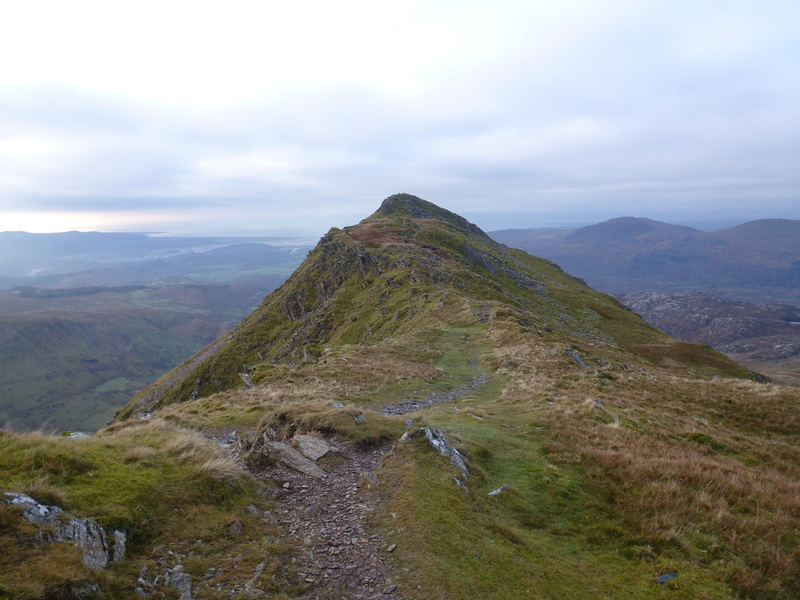 ​Dave had climbed Cnicht (Knight) before but for Angie & Fudge it was their first time up. 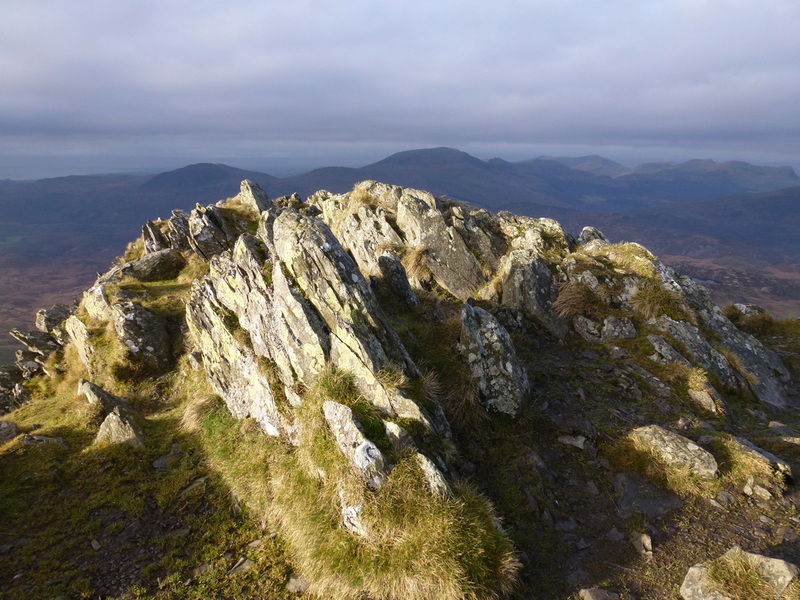 At 2260ft (689m), it provides lots of interest, good walking and a nice scramble to attain the summit. 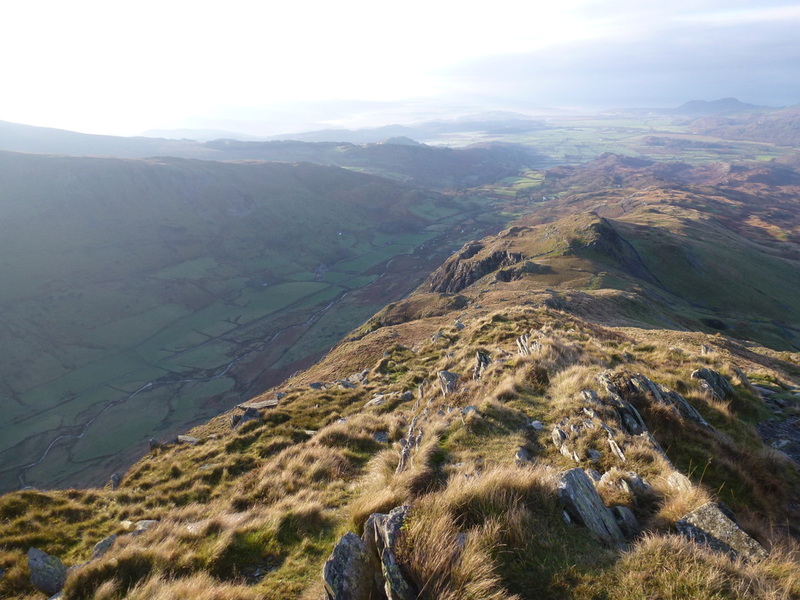 It was our intention today to come off the North East Ridge and head over to Rhosydd Quarry and then climb both Moelwyn Mawr & Moelwyn Bach - that was the plan anyway! 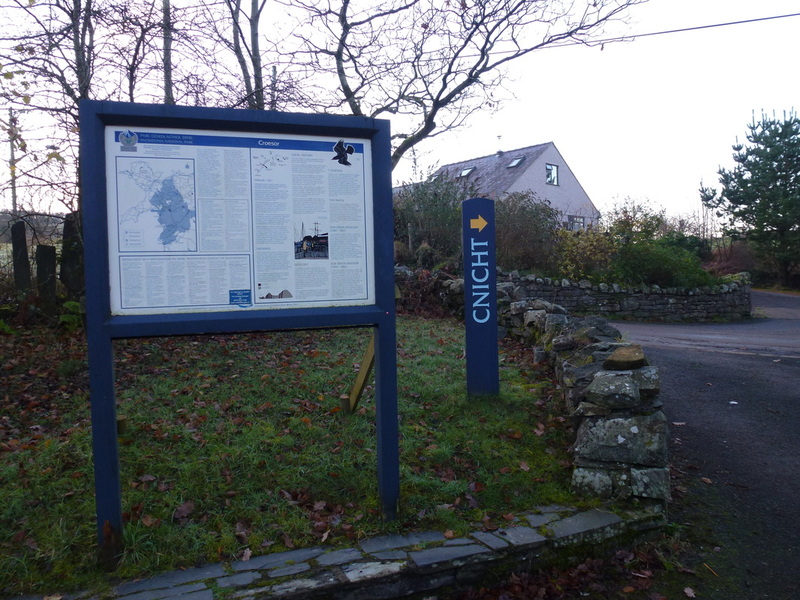 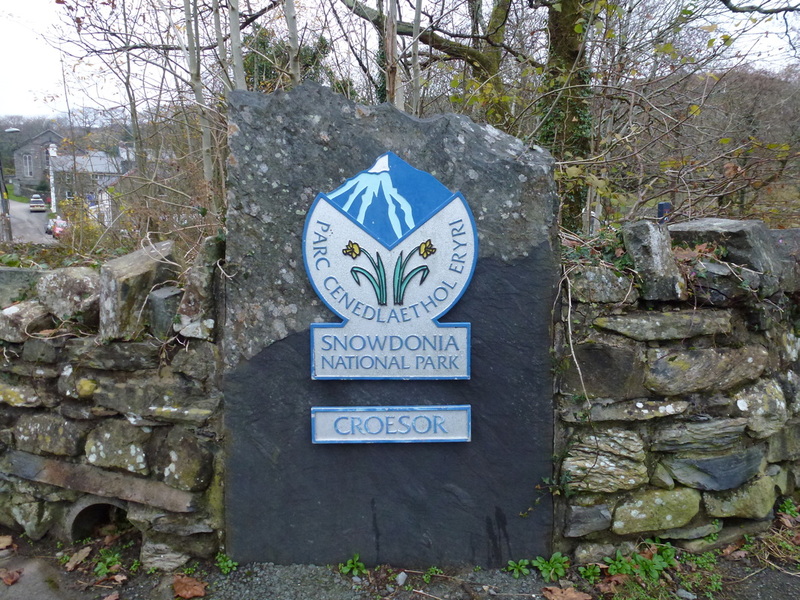 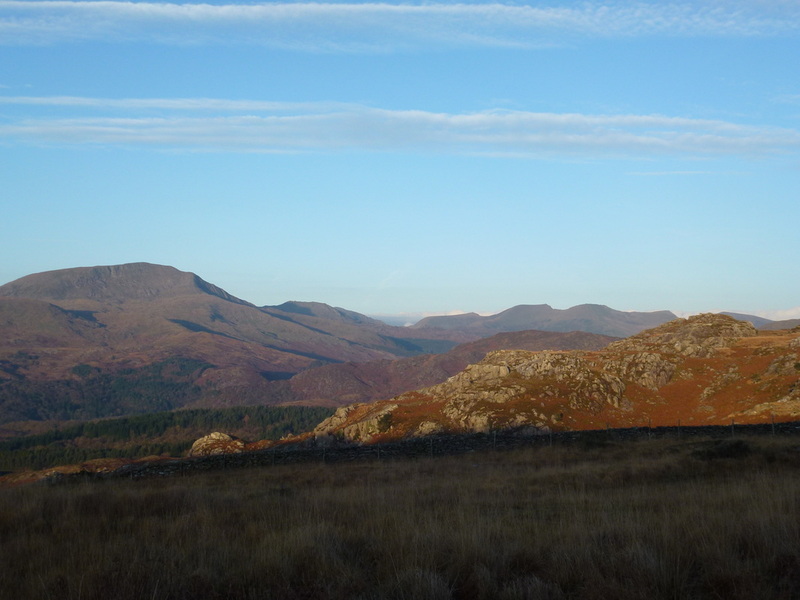 The walk starts from the ample and free National Park Car Park in Croesor. 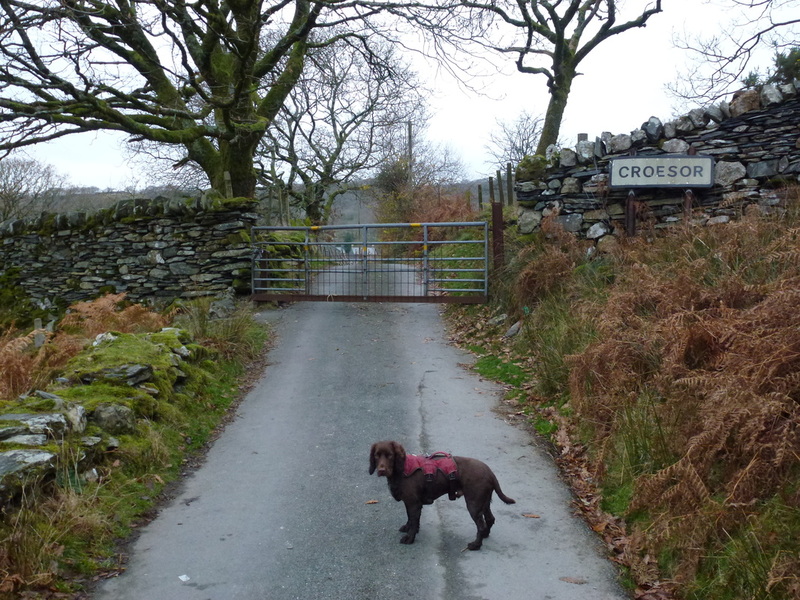 We took our time driving up the road to Croesor - it narrows in places therefore we drove carefully and thankfully arrived in one piece. 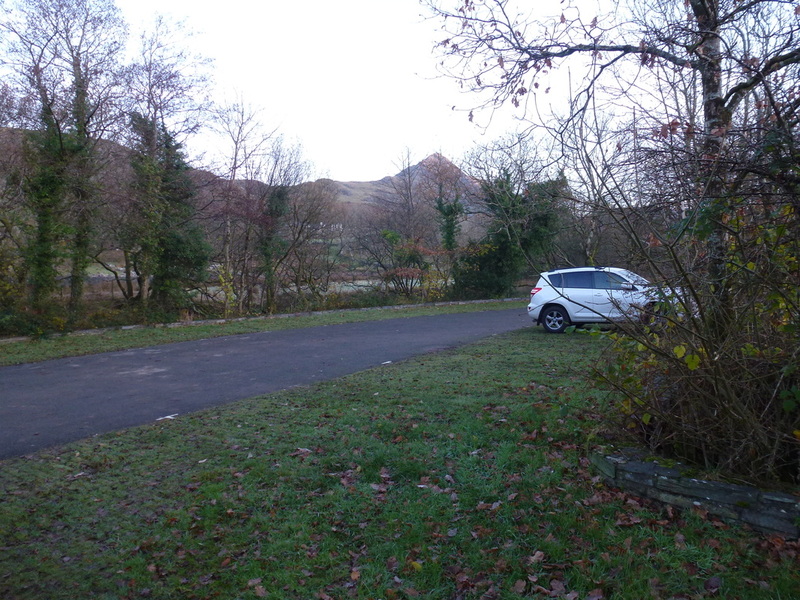 Leaving the Car Park we turned right and headed up the hill and before long reached a gate leading on to the open hillside. 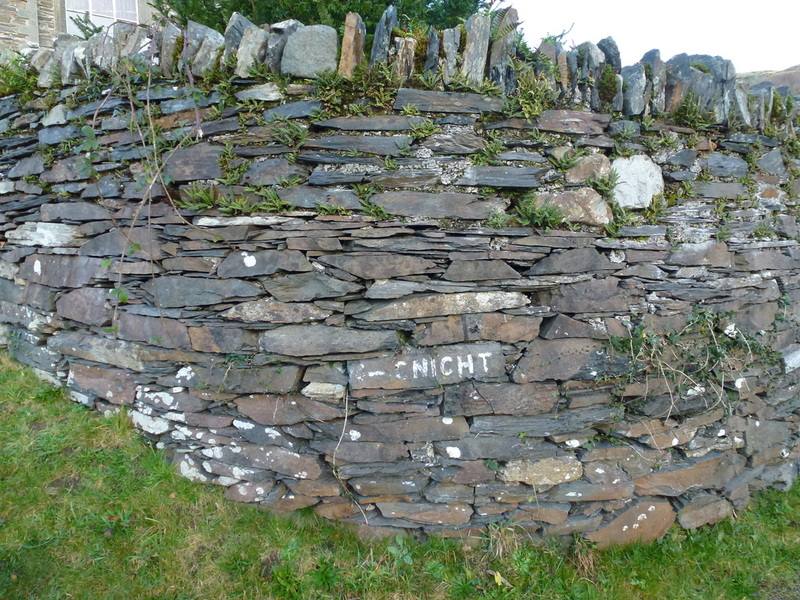 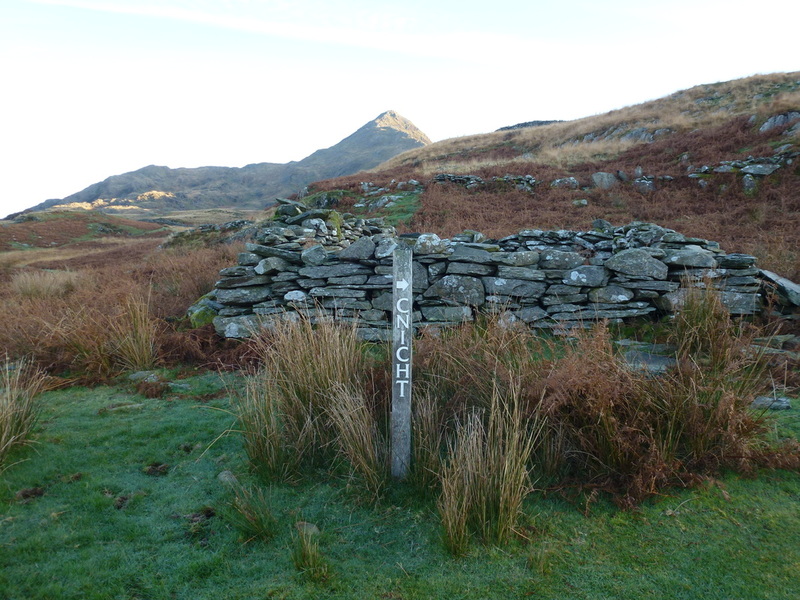 There are ample signposts around, however in good visibility (which we had) the view of Cnicht was with us all the way. 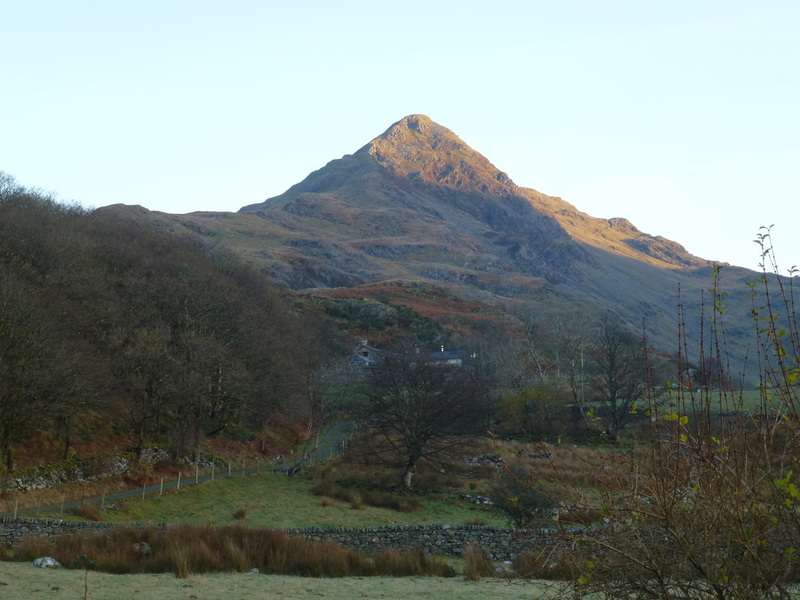 There now began a gentle and long rise up the mountain, all the time enjoying superb views over to Moel Hebog and the Nantlle Ridge. 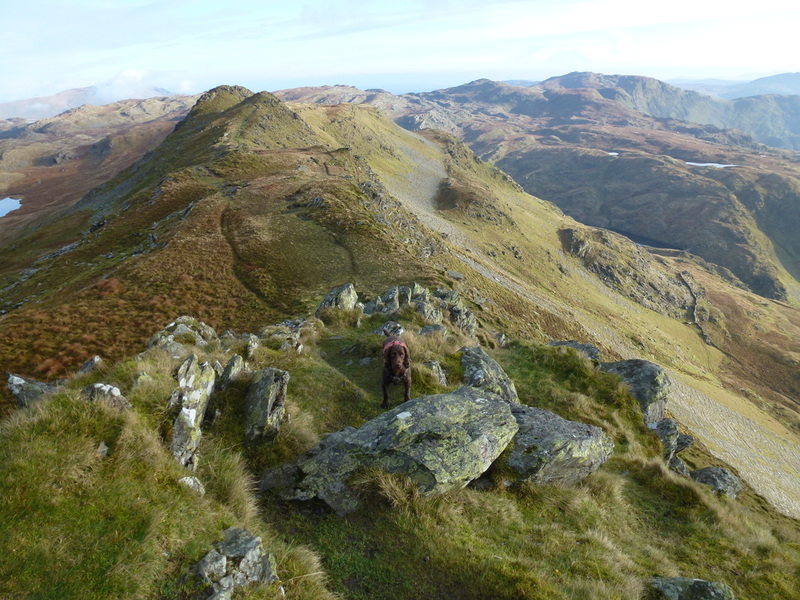 Reaching a gap before the summit, to some the view of the climb ahead will be quite daunting but there is a good path up the last few hundred yards with a need for some gentle scrambling in places in order to get to the top. 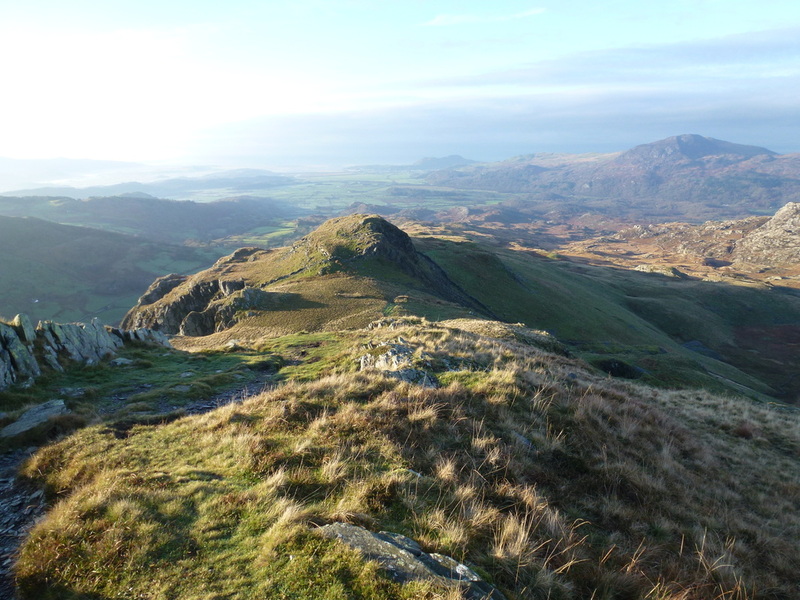 Reaching the summit, we enjoyed superb views over the Moelwynion to Moelwyn Mawr and likewise to the Snowdon Range. 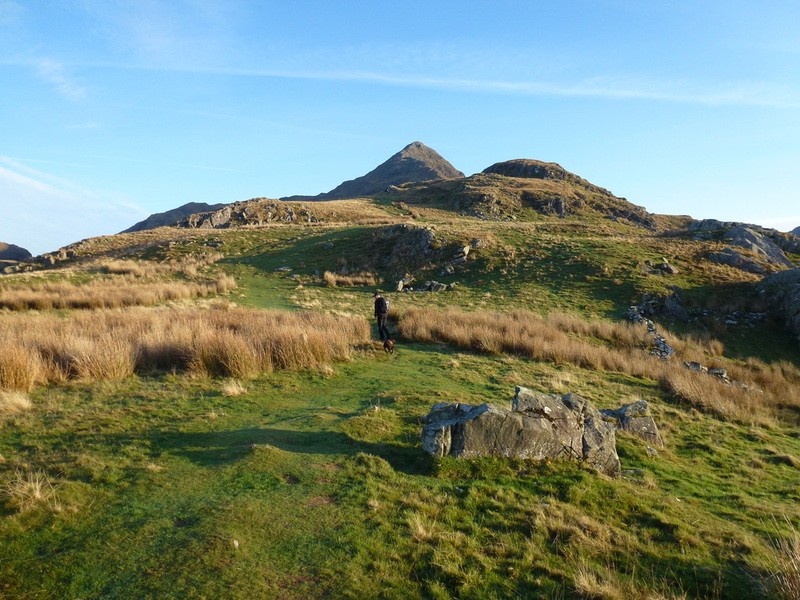 Leaving the summit, it is tempting to make a direct beeline for Llyn-Cwm-Corsiog however we remained on the path down to a junction of paths before turning to the right. 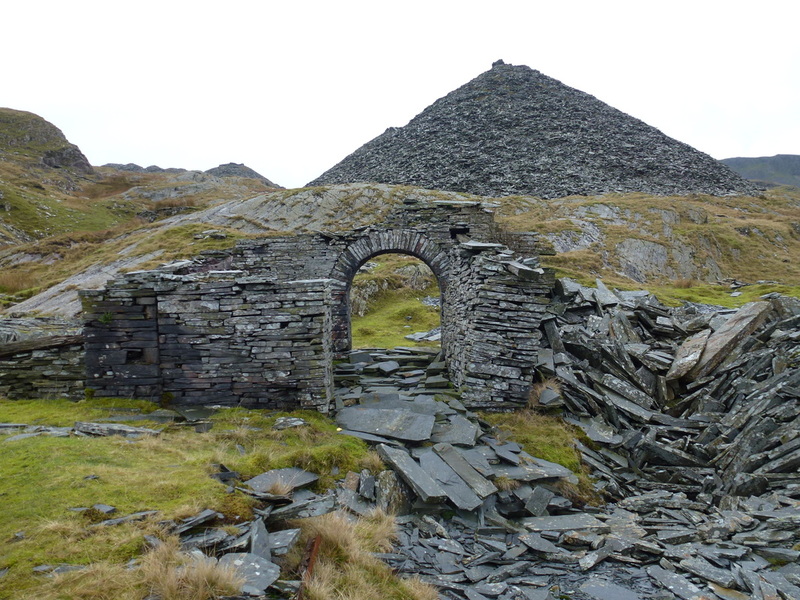 It was at this point the path became intermittent and it was simply a case of taking bearing after bearing in order to remain on the right line to both the Llyn and subsequently the quarry remains at Rhosydd (link here). 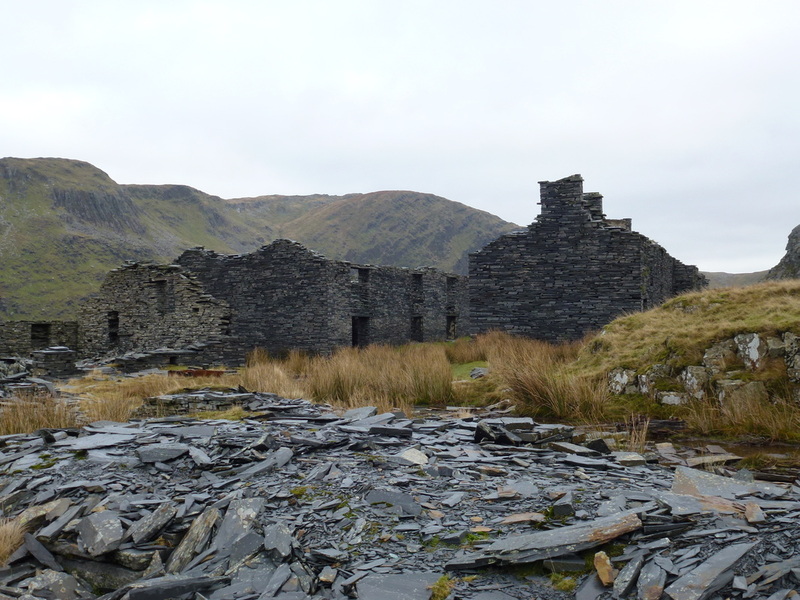 Rhosydd is a fascinating place and it is good to sit for a while here amongst the ruins and imagine what it must have been like in the early to mid 19th century when they first began mining slate here. 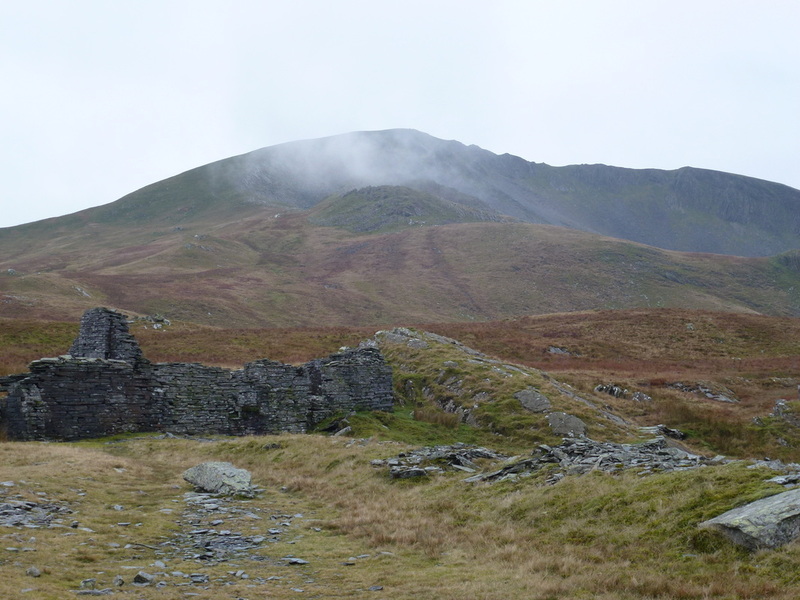 From Rhosydd the path ascends two short but steep inclines and then the route sweeps away to join the ridge leading to Moelwyn Mawr - it was here that the weather really came in and mist enveloped us as we made our way up the steep ascent to the summit. 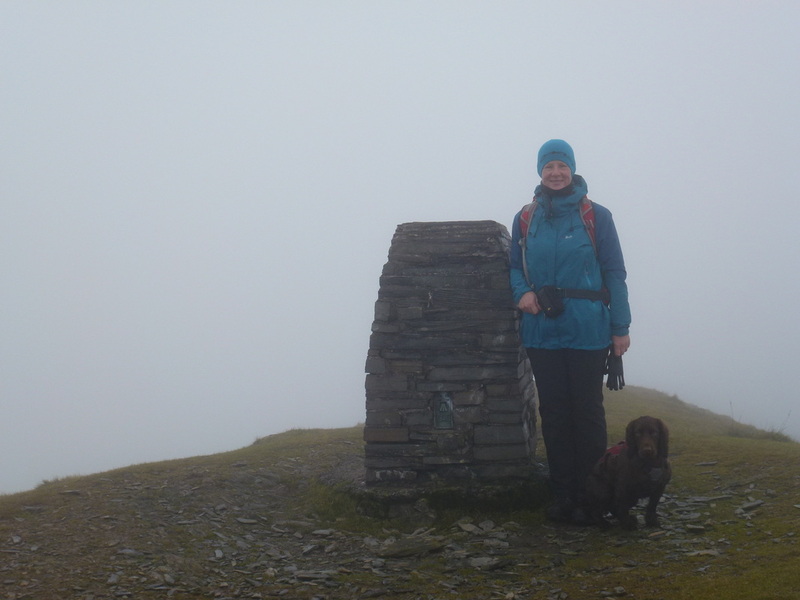 Arriving at the Trig Point all was a sea of cloud & mist however we saw the first person we had seen all day - a member of the Mountain Rescue who was out for a day walk from Blaenau. 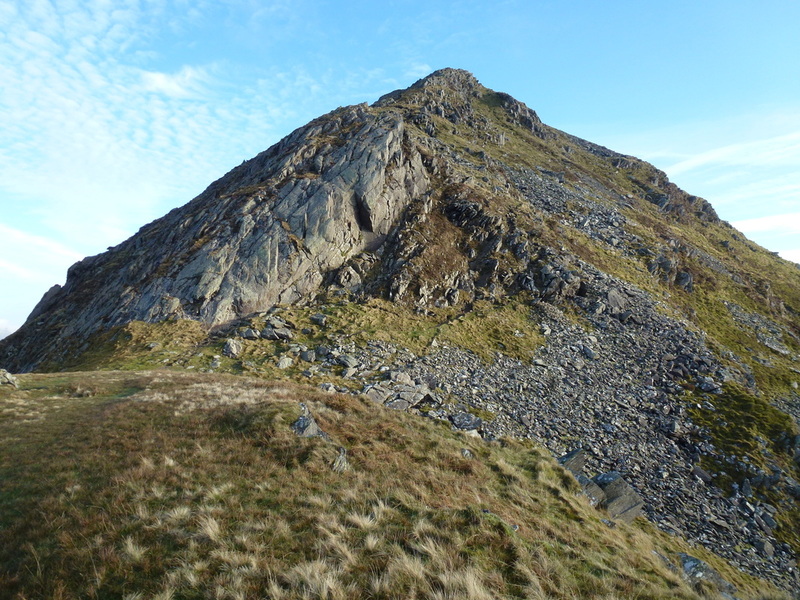 We had a chat with him for about 10 minutes before making our way off steeply and sometimes precariously over Craigysgafn to the col at Bwlch Stwlan. 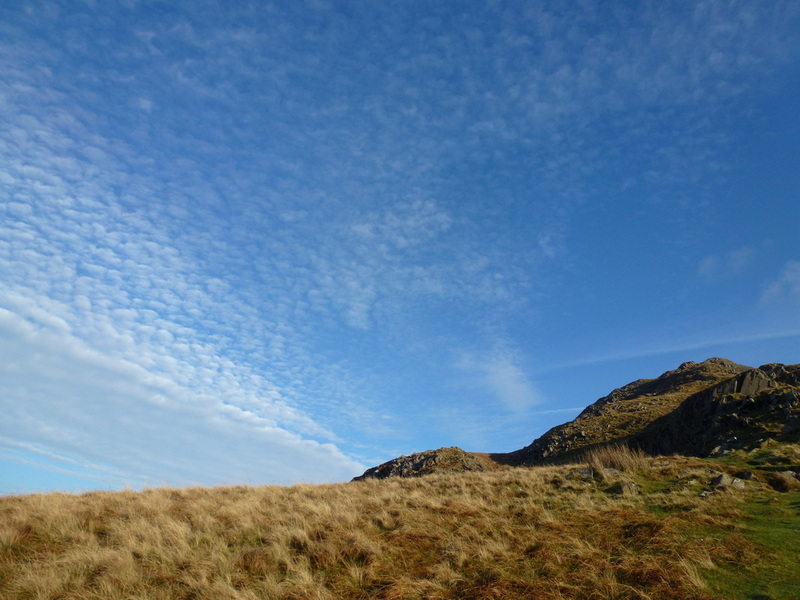 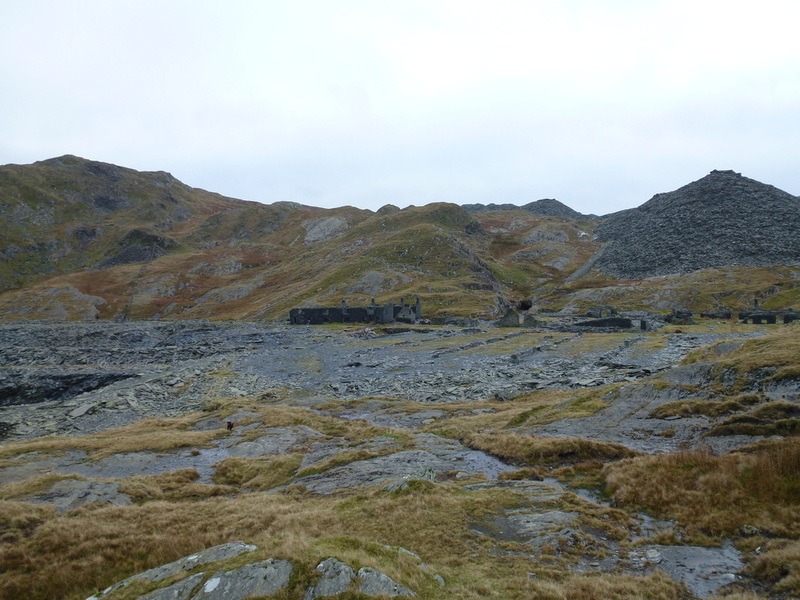 It was here that we decided to cut our losses and forego the climb of Moelwyn Bach and save it for another day. 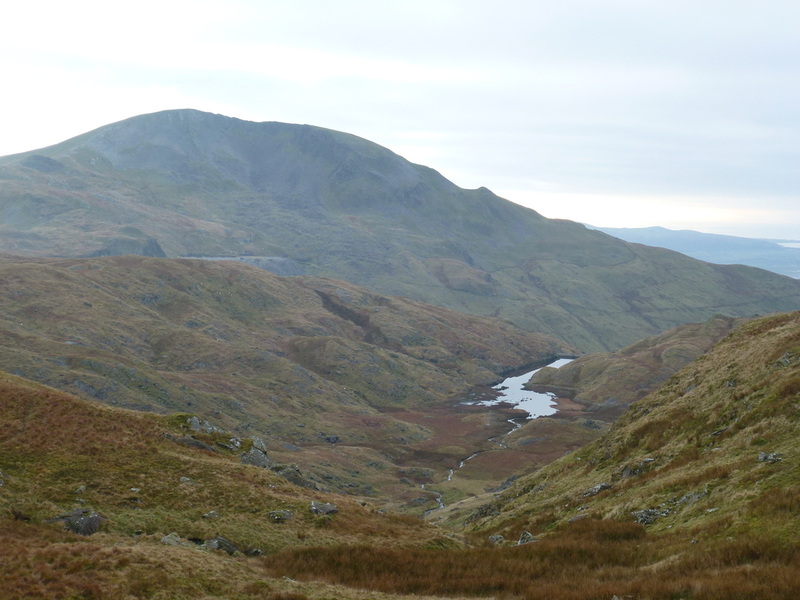 Instead we made our way down a somewhat boggy and intermittent path to the plantation and subsequently the undulating road that leads to Croesor. 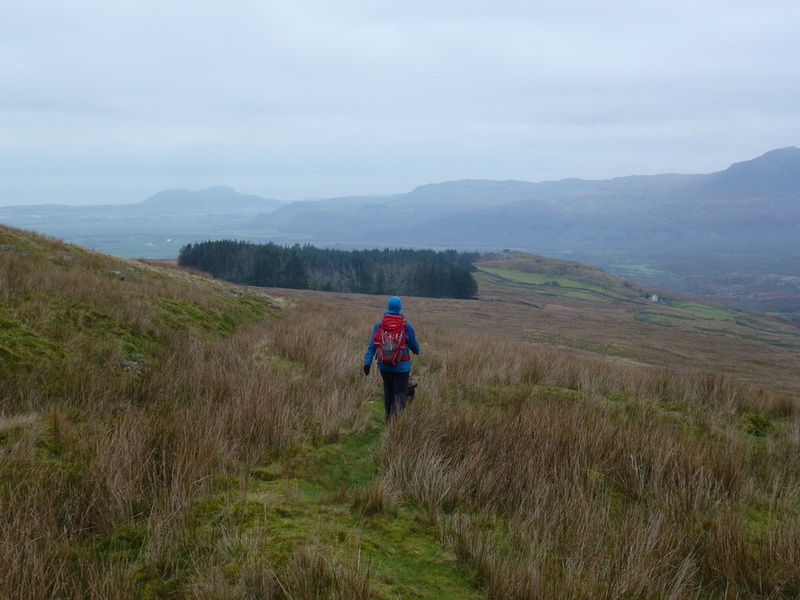 This walk just goes to show how fickle the weather can be and that you have to know what you are doing when the weather closes in - as it did on our approach to Moelwyn Mawr. 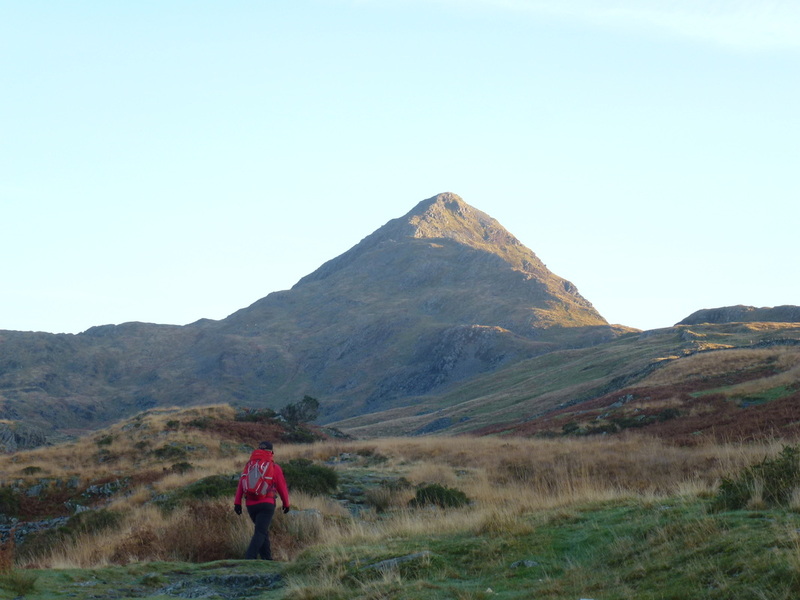 It was a game of two halves today with the weather and visibility but glorious walking all the same. 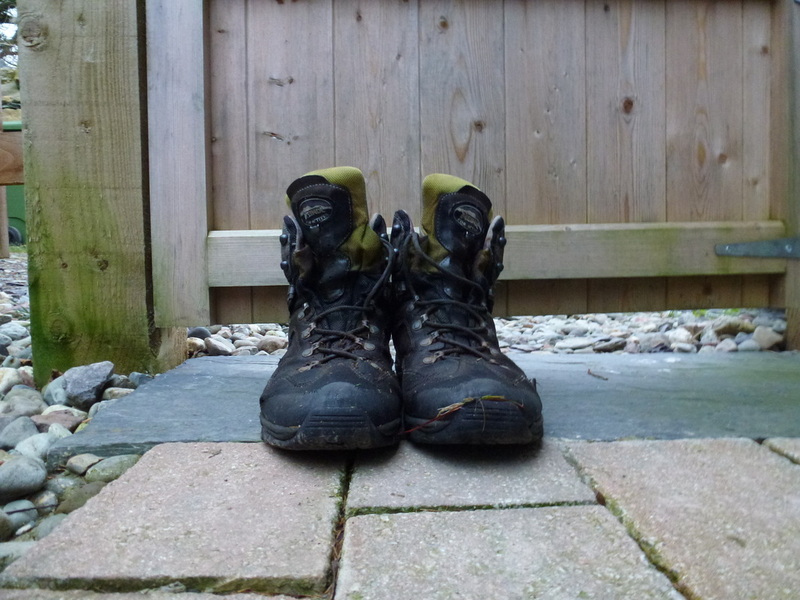 Goodbye old friends - Dave's walking boots had finally had enough. 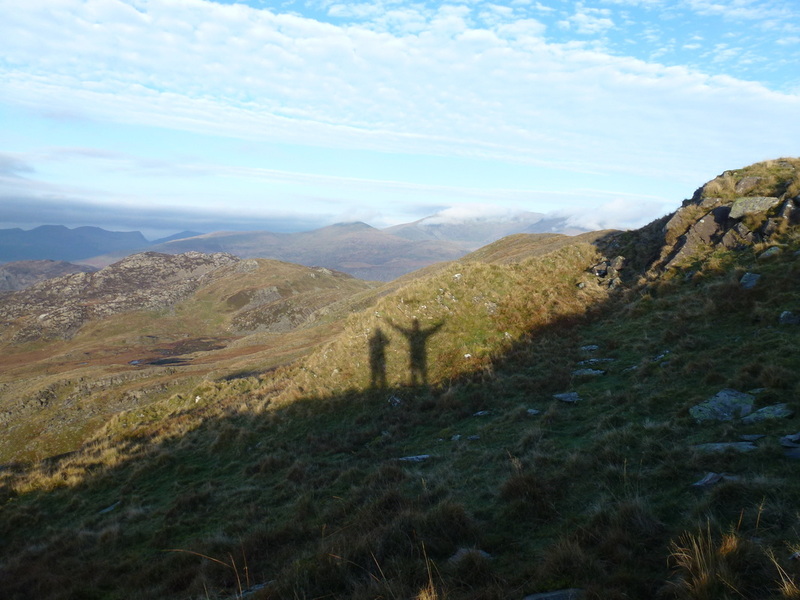 Faithful and true servants.